The Fourth » See, we told you the snowman would come back! See, we told you the snowman would come back! There is no Christmas in Idenau, but there is some kind of winter festival apparently. This winter, Skärva Claus is rewarding all those on the naughty list! I hope you all have a wonderful time, whatever you celebrate. You have all given us a great gift in allowing me and Victor to share our world with you. Thank you so much! but slice’s nose doesn’t glow! Davis is a cute little angle! I want one. Slice doesn't have a nose D: But he leads them with his pure heart! I really like the starry background in this one. Instead of a solid color with some white dots, you added in a layer of clouds, and it just looks awesome! The expressions are also great, my favorites being the flishes’ and Veronika’s “I don’t want to be here” faces. Loving the festive header too! And thank you! Enjoy the holidays, you two! Thank you! Starry nights are fun. Every time I make one, I try something a little different. I’m sure it will! I look forward to what the new year brings. I’m glad you’ve been a part of it already! I love your comic by the way! Just started reading it after coming across an advertisement, which unlike most comic ads, it was actually funny. davis seems really angry. 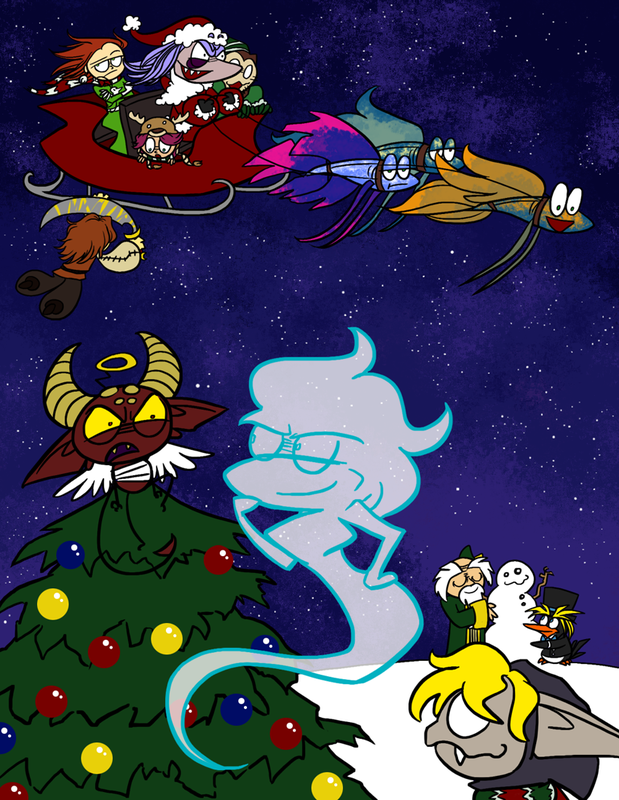 not because hes on the tree, but because he cant do that to ecta. There are a lot of things Davis wishes he could do to Ecta that he can’t do.